THE Rockhampton region is the centre of world attention in trailing a new carbon capture technology. Callide Oxyfuel Project director Dr Chris Spero yesterday said the world was watching with anticipation as the Callide A Power Plant had been transformed as the world's largest display of Oxyfuel technology - a new, emission-reducing, carbon capture and storage initiative for power plants. At the International Oxyfuel Combustion Conference at Yeppoon's Capricorn Resort yesterday, Dr Spero said the Callide project was the largest-scale demonstration of the technology and everyone was "anxious" to see how it worked before the plant was fully operational in 2016. More than 160 people have gathered at the conference to visit the station and learn more about the technology. In one of his presentations at the four-day conference, Dr Spero used a 1965 article from The Morning Bulletin which announced the opening of the station as the first coal-fired power station in Queensland. He said it was ironic that in 2011, 46 years later, the plant was "being reborn" as yet another example of new technology. 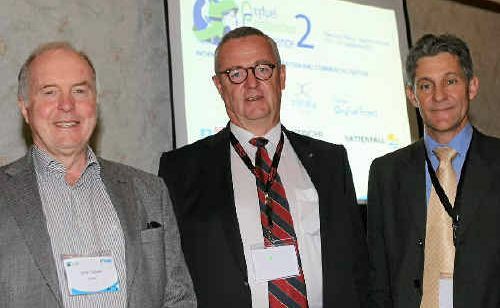 While Oxyfuel still relies on burning fossil fuels, German research and development company Vattenfall vice-president Lars Stromberg said it was the term given to the use of oxygen for combustion instead of air, which released concentrated carbon dioxide that could be captured and stored underground. Dr Spero said the technology produced almost zero-emission electricity and the underground storage of carbon was the same process nature used to store vast amounts of naturally formed gasses, like carbon.